Hotel Sofitel Berlin Gendarmenmarkt. Book online now! 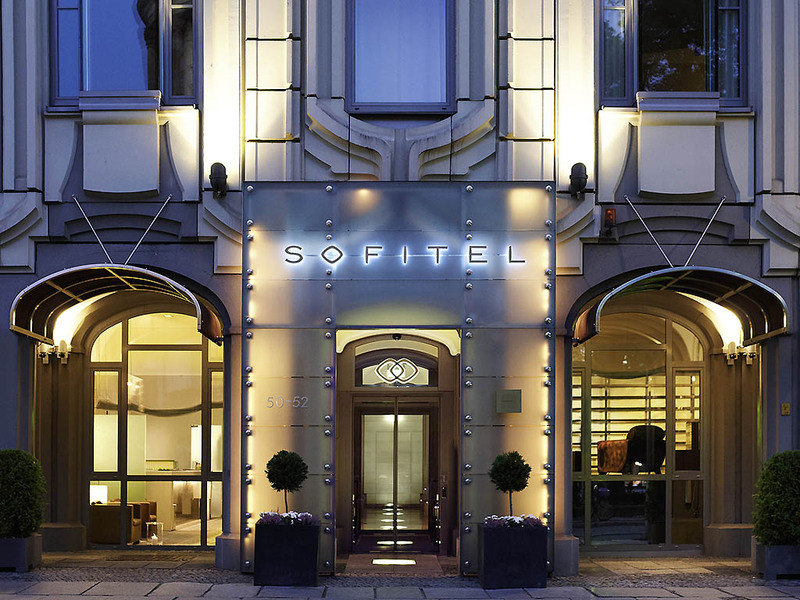 In one of Berlin's most beautiful squares, the individual boutique hotel Sofitel Berlin Gendarmenmarkt, merges historical and modern elements into a harmonious design with a touch of France. Our team is happy to bring you a home from home. Our luxury accommodations encompass 70 elegant rooms and 22 exlclusive suites. Some of these first-class accomodations provide direct view to the french cathedral and the Gendarmenmarkt. A heaven of silence feature the rooms to the inner court. Enjoy the buffet breakfast in a relaxed atmosphere in our café's bright atrium. Local and international specialties make for a delicious start to the day. Savor Austrian and international delicacies in the afternoons or evenings and enjoy fine wine from the Horcher vineyard in the ambience of a Viennese coffee house. The Hotel was amazing right where we needed it to be. Sad that the hotel would work with me (an Accor Hotel employee) with 2 other rooms that were suppose to be canceled but somehow never were and I got charged a no show fee. Lovely room and treats, smily staff always acknowledging and helpful when encountered. Thank you for the excellent service. Good rooms, quiet but well located location. Staff friendly and attentive. Small rooms. Our room was upgraded. Thank you. Because I can hardly imagine the size of the room I originally booked. Honestly speaking it's not a 5* hotel. More business like. Although the location is absolutely perfect. The breakfast isn't worth the money you ask for it. The quality of food you offer for breakfast must be improved. Ideally located, and as well appointed as I've come to expect from a Sofitel. The service and welcome was as excellent as always. Breakfast choices were fantastic. Would recommend. I have been staying at your hotel for over ten years and have always appreciated the politeness of the staff, the comfort of the (small) bedrooms, the excellent position on the Gendarmenmarkt and the very good breakfasts. We enjoyed our stay. There is easy access to the U-Bahn and there are shops and good restaurants nearby. Top class hotel in beautiful Gendarmenmarkt Square! Thoroughly enjoyed our stay; our room was great with top views over Gendarmenmarkt Square, exceptional dining experience in Aigner Restaurant and friendly and helpful hotel staff. We visited for my sister’s birthday and the hotel gave us a bottle of champagne on arrival which was such a surprise and a really lovely touch. This was our second visit and it was just as fabulous as the first. The hotel is stylish, comfortable, modern and quiet. The location is beautiful and close to lots of restaurants and bars. There is a U Bahn station just round the corner, although we walked pretty much everywhere as the weather was amazing for February. Thank you for a memorable stay. Well located, quiet, totally accommodating. Great stay, very friendly and attentive staff and excellent location! Overall I had an excellent stay. First I was given room 510 which is extremely small and not very nice. After calling and asking for a new room I was swiftly moved to a better. larger room on the same floor. I met several staff members throughout my stay and everyone was extremely friendly and helpful. The breakfast buffet has a very good selection and the service was great. Needless to say the location of the property is excellent and I can highly recommend this hotel! It was a good experience although I did a mistake by the booking and a no show was counted for one night. It is very difficult to rate a business like Hotel, during a one night stay for business. Everything was excellent, especially the concierge / reception who has listened to my request and upgraded me to an excellent room with a view on the Square. Didn't had the chance to try your restaurant, or even to enjoy the free drink for that matter. BTW, the A/C was at its warmest (24 c), yet the temperature in the room was OK but a bit limit for me personally.